Follow one New Musician and her mentor through their first year of United Sound! Megan is empowered to take control of the rehearsal and performance with "her girls." The first United Sound chapter in Illinois is having some amazing experiences! An Inside look at the United Sound National Ensemble, featuring interviews from parents of New Musicians. What do parents have to say about the United Sound experience? This tiny clip has been shared on social media over 2,000 times and received over 200,000 likes. It's the perfect (unedited) example of the true power of music and friendship. United Sound New Musicians along with their mentors prepare to march in the 2017 Rose Parade with the Bands of America Honor Band. Michael Klesch's beautiful arrangement of Josh Groban's, "You Raise Me Up" at Bandfest to highlight the inclusion of United Sound in the ensemble. There was not a dry eye in the house. United Sound students performed with The Ohio State University Marching Band at Bands of America's 2016 Grand National Championships for over 30,000 people. Following their debut performance with the marching band at a halftime show, students at Western Carolina University gave a recital to show off their skills. United Sound teachers talk about how this club has impacted their students. The 2016 United Sound National Ensemble performing "A Celebration for My Three Best Friends." The nation’s FIRST United Sound Jazz Ensemble! 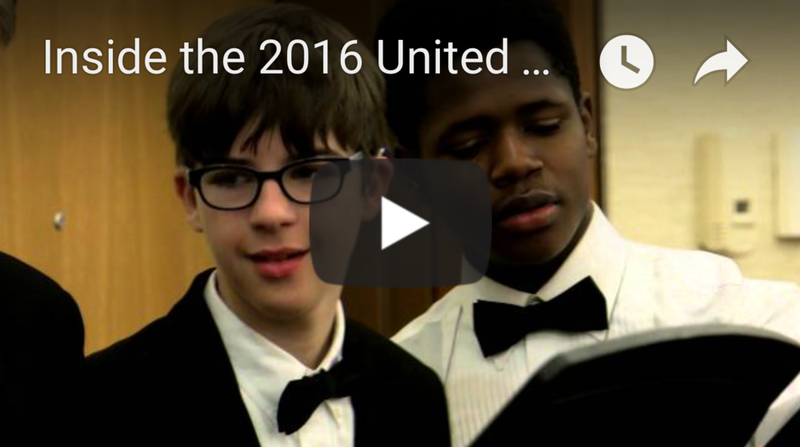 Music for All created this beautiful video about their support of our organization. Thank you, Music for All! United Sound is a lot of things and practicing bravery in a big, scary, safe environment is one of them. Watch to the end. See the last 10 seconds where the room erupts and Cory KNOWS he has succeeded. This is a room full of kids who say with their words, their patience, and ultimately their cheers that Cory is worth waiting for. What you don't see: the 3 minutes of ::silence:: where ALL EYES were on him as he struggled valiantly to speak to such a large group (60 students!). Just love this kid! One of our favorite New Musicians. "Can you do it on another string?" Her answer: "Sure, BFF." Considering a United Sound chapter at your school? Take a few moments to watch this video about First Experiences from the teacher's perspective. Tempe High School coverage. Includes Bronson's song, "Be You!" Ravenwood High is the first school in Tennessee to pilot a unique and wonderful program called United Sound. Watch the very first days of United Sound at Tempe HS as one young man begins playing the instrument of his dreams! Great things are happening with the United Sound chapter at Highland High School. We are BIG fans of Mr. Bill Bitter. Andres shows us how the curriculum works. Lauchlin reaches out to his hero, Jeff Coffin, from the Dave Matthews Band. Later...they meet! Founder of United Sound, Julie Duty, shares the "why" for creating this program.